The appy sporthorse and the pinto pony have both gained another layer of color. 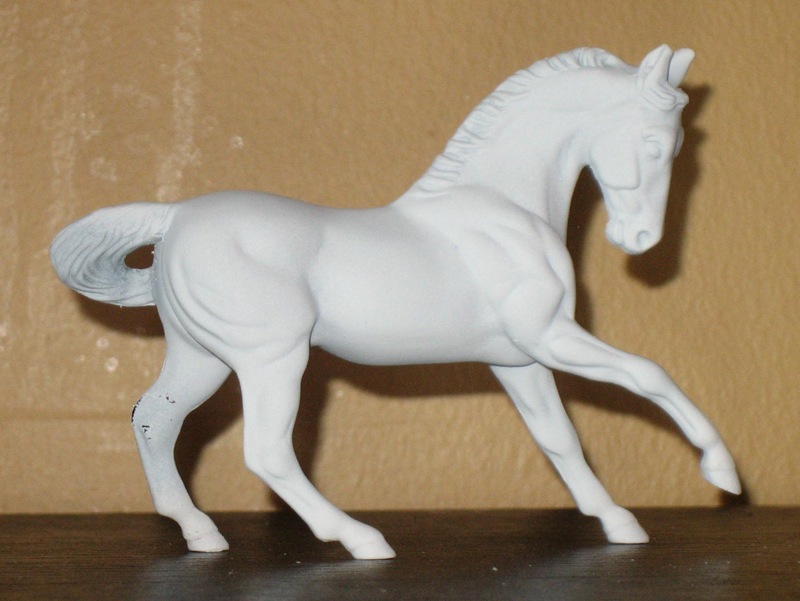 Meanwhile, I am sanding, sanding, and sanding some more to get Sleipnir ready to paint. That’s my pile of used sandpaper… from one side. All those pieces makes for a lot of little seams. I’ve finally got both sides done and a couple teeny holes patched, so hopefully is ready for final priming. Fingers crossed! 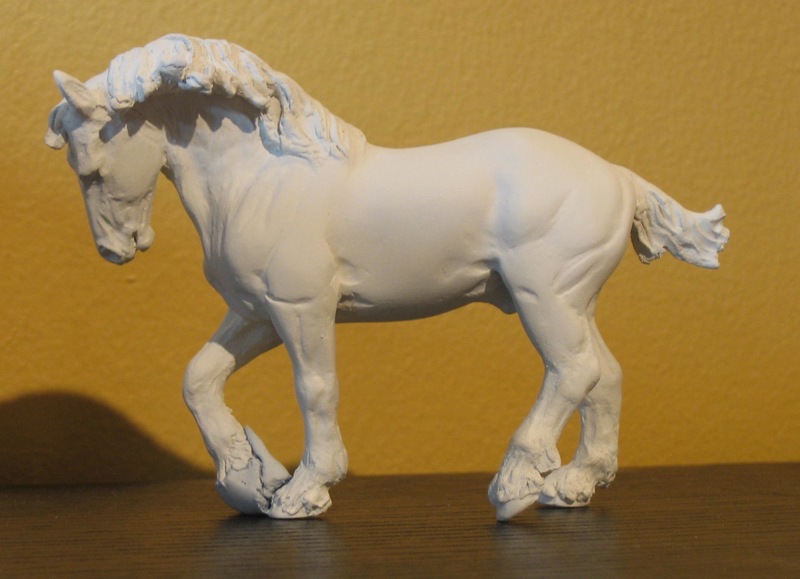 Sleipnir may be getting the most press, but he’s not the only horse in progress. 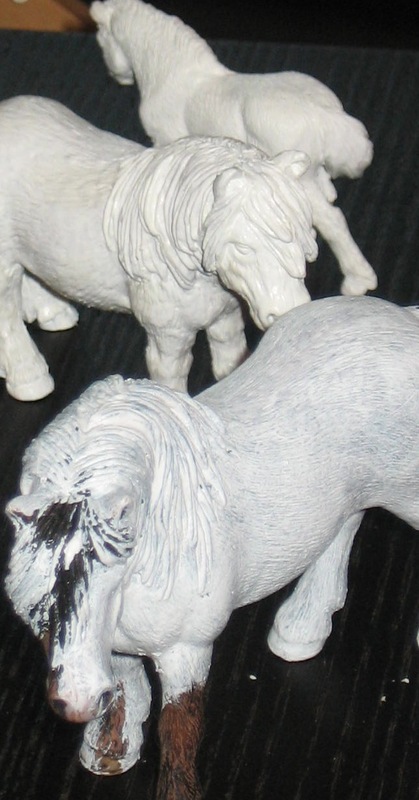 I’ve got a little herd of horses just about ready to be painted. 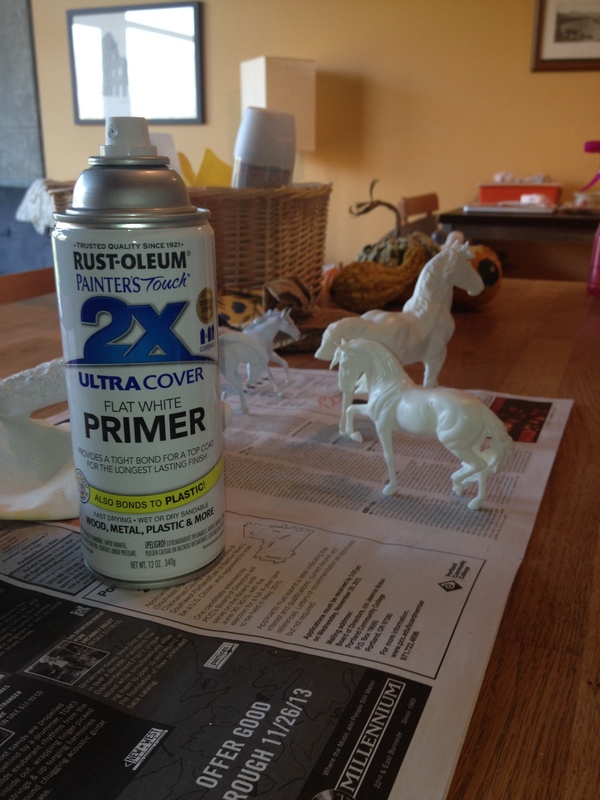 These two are getting their primer coats. 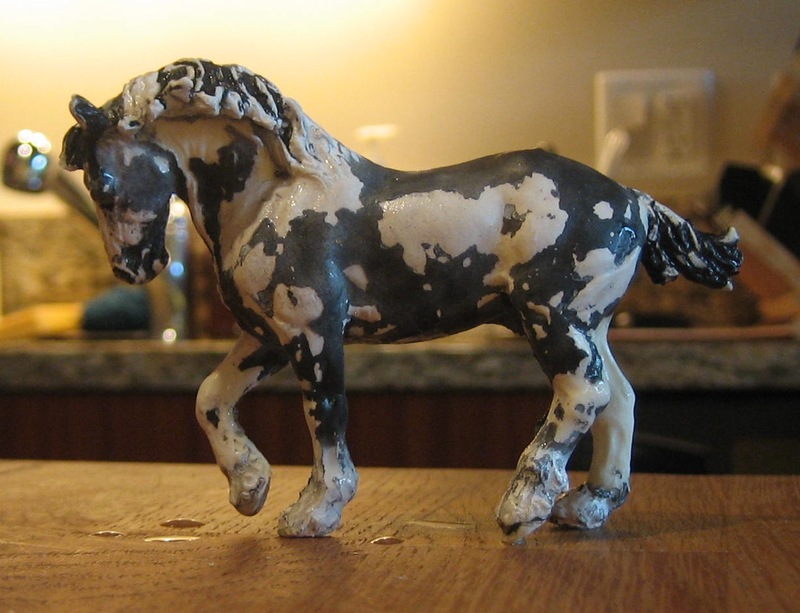 The G3 Warmblood is a commission and will be a black appaloosa. The Roll resin will be a roany chestnut. 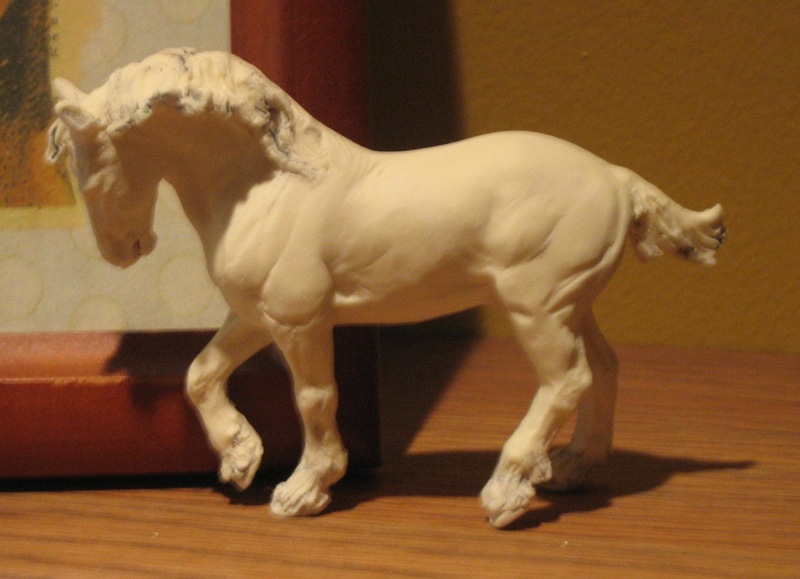 He’s been kind of a pain to prep and prime- every layer brings out more little imperfections. But he’s getting there. 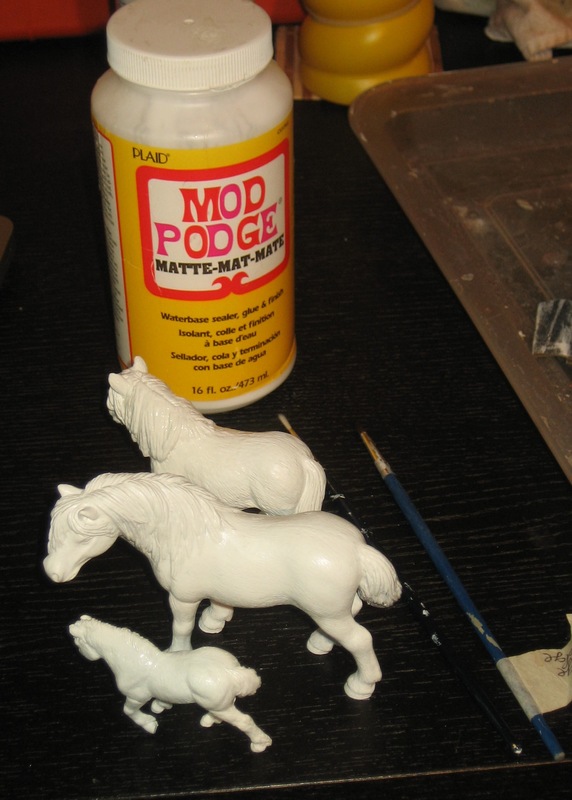 These ponies are all made of that rubbery plastic that sometimes gets sticky, so after they were fully primed they each got a couple coats of modge podge. That seals them so I won’t have an stickiness issues later. The Shetland (top) will be a chestnut pinto, the Dartmoor (middle) will be a black leopard British Spotted Pony, and the little Toob pony doesn’t have a color yet. 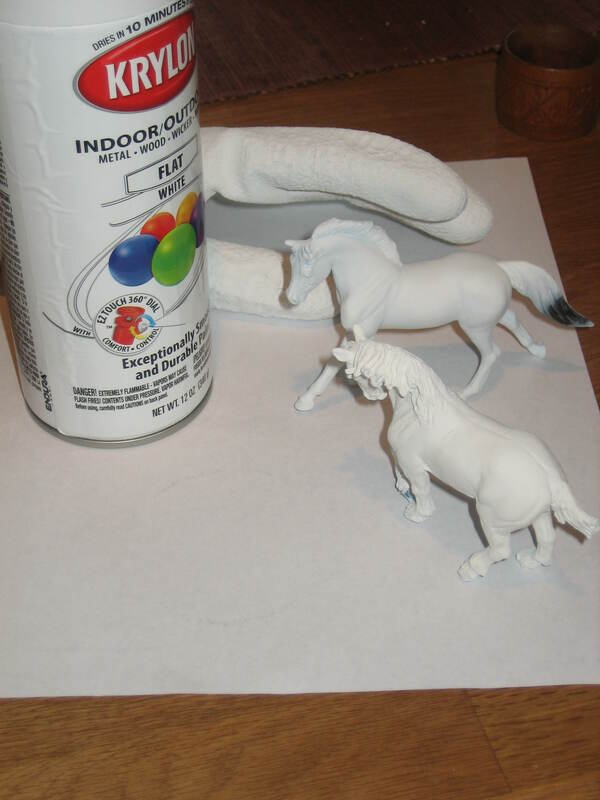 I should add that if you want to create the modge podge seal over the primed horse instead of over a finished paintjob, you’ll likely need to apply a layer of fixative (Dull Cote, Krylon Matte) to provide some tooth for the color to stick to. 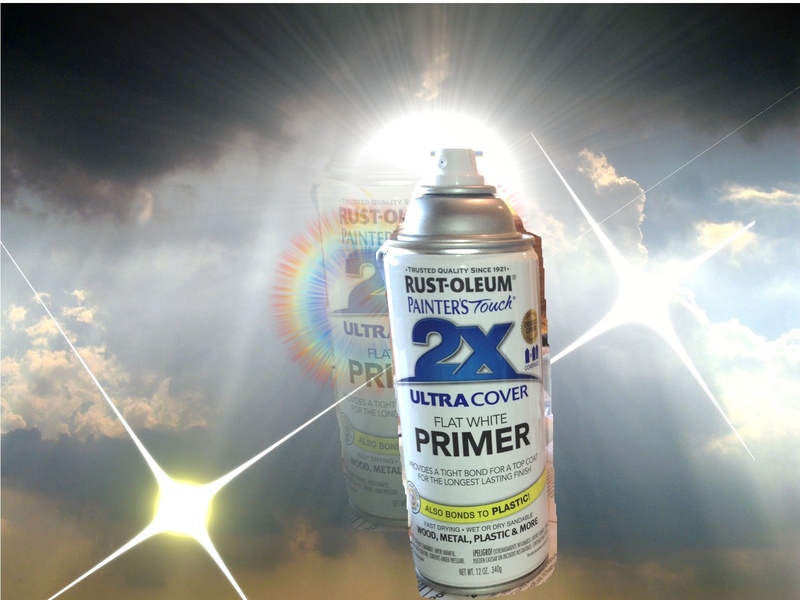 I’m really excited to get painting. 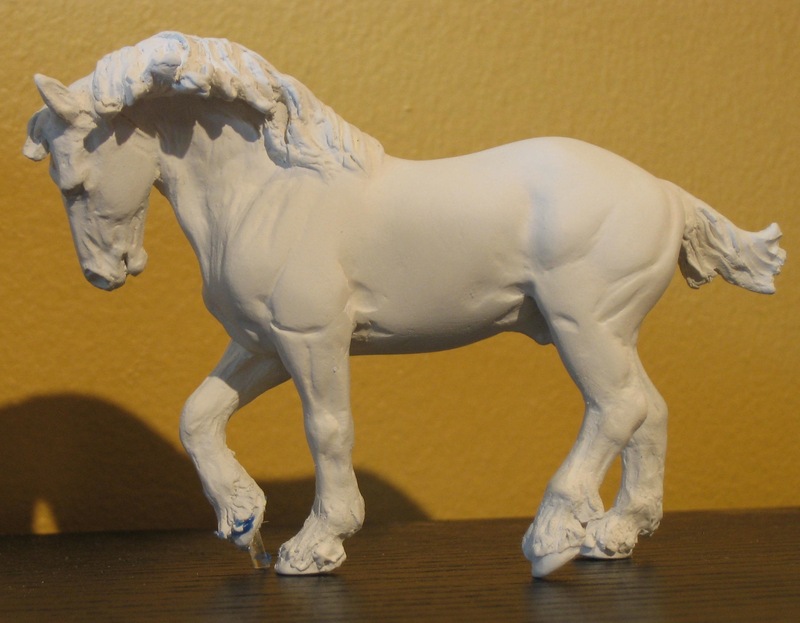 Sleipnir has a lot of little issues that need to be addressed first, but I’m hoping to start him with this batch. I have some cool ideas regarding his paint job. 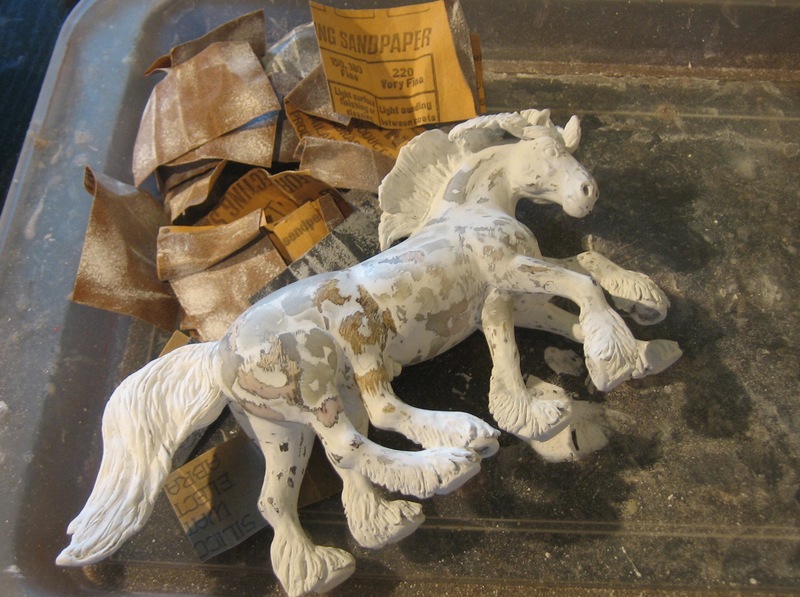 Is there any blogger who can resist a racy title when talking about stripping paint off model horses? I obviously cannot. Before this recent foray, I had never needed to strip off a previous paint job from one of my bodies. 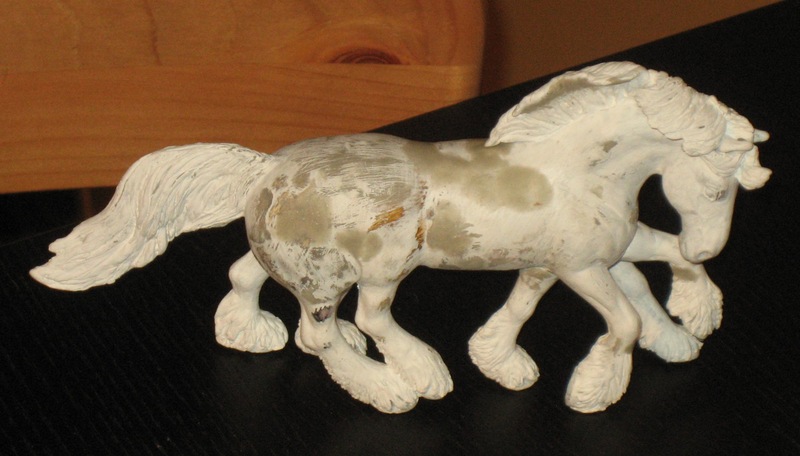 I was usually working from an original finish horse, and the few times I wasn’t I just sanded down the original paint job until it was smooth enough to re-prime. 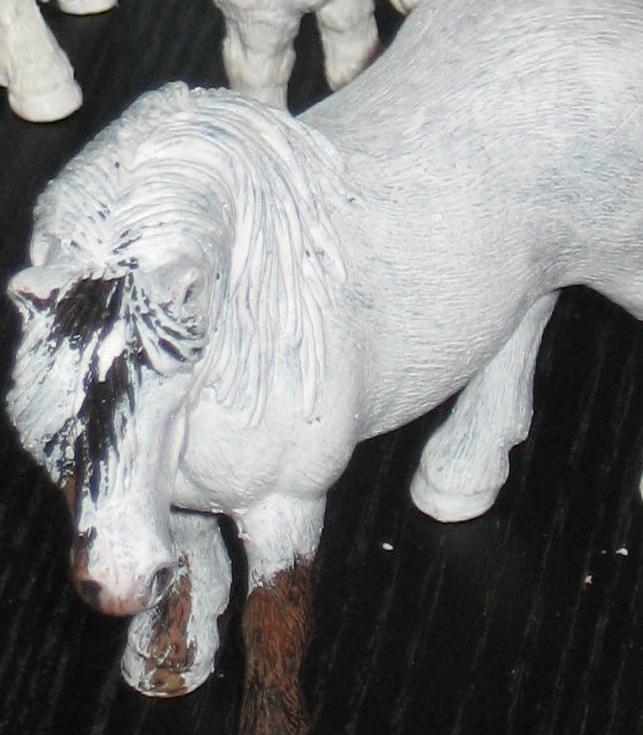 But I recently found myself with three models in need of stripping: a Breyer SM with a thick lumpy acrylic coat, a multi-media Schleich with layers in acrylic, pastel, and modge-podge, and a resin with a mediocre acrylic paint job. So I finally started paying attention to all the discussions of technique. After a little research, I decided to try to Oven Cleaner technique. And of course, to chronicle my trials here for whoever else might want to give it a go! To strip a horse using oven cleaner, simply stick the horse in a bag, spray liberally with oven cleaner (I used the recommended brand Easy Off) and wait. 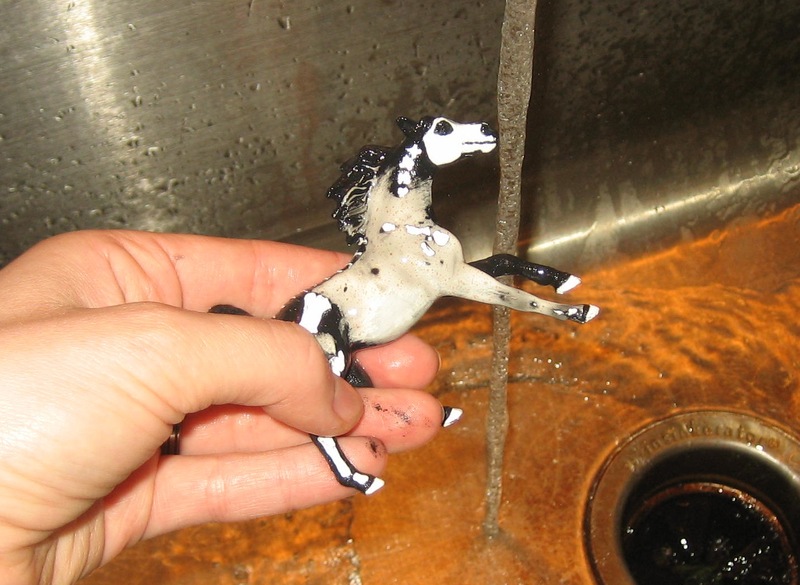 After an hour or so, remove the horse and scrub with a toothbrush under warm water. Repeat until clean and add time in the bag as needed. WARNING: Oven cleaner is made of nasty chemicals. It is smelly and if you get it in a cut it will burn. 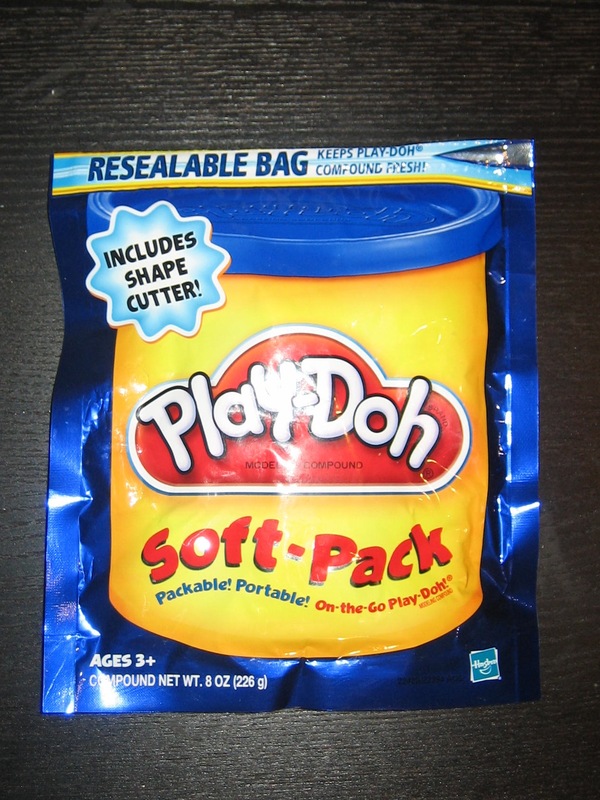 Avoid inhaling it, getting it on your hands, etc. Keep away from children and pets, and wash your hands! This guy was easy to strip. His acrylic coat was so thick it was begging to come off, and after only about an hour in the oven cleaner he was ready to go under the sink. 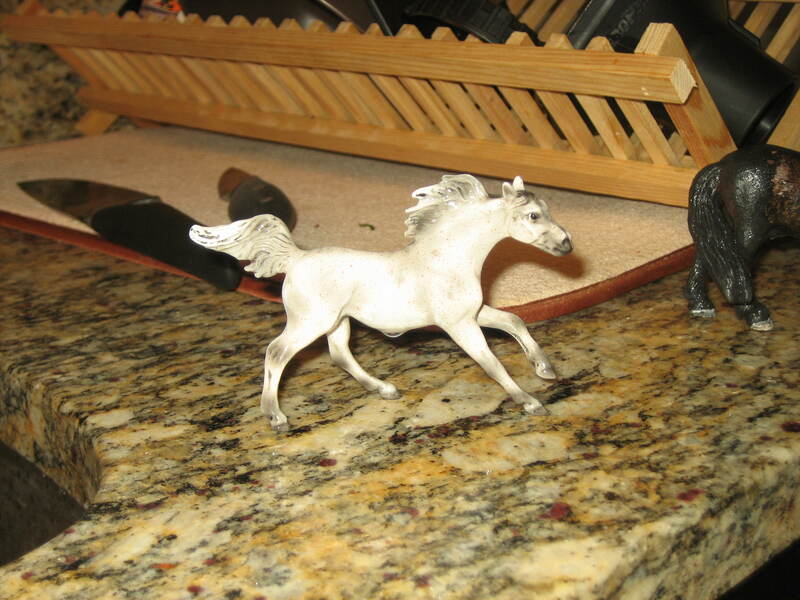 I was a little bit worried that the oven cleaner would eat away at the soft rubbery plastic of a Schleich horse, so I didn’t leave him long in the bag the first time. I got a little braver and left him in for longer, reminding myself that if I’m gonna ruin a body it might as well be a cheap one that I have no specific plans for. 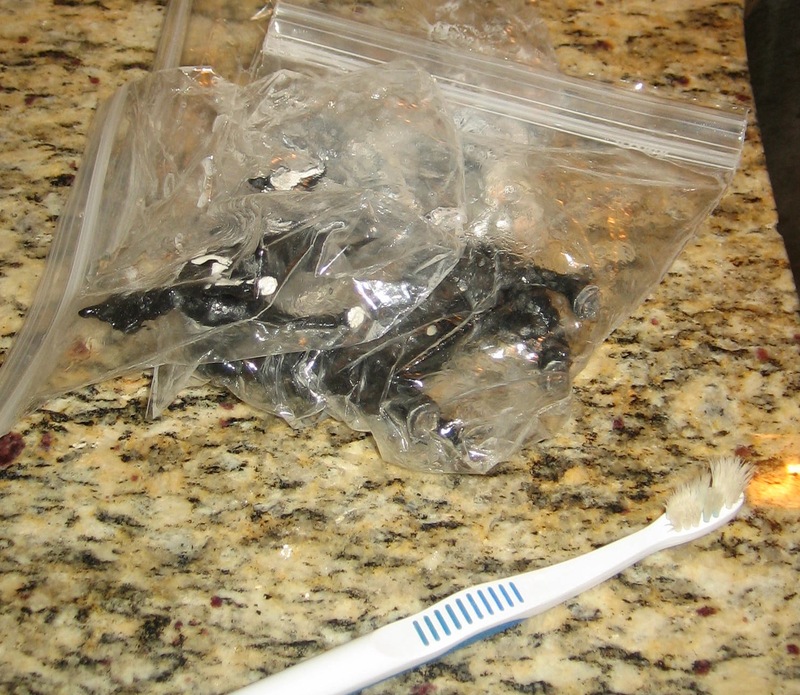 It ended up taking quite a while to get him relatively clean- I estimate that he spent 5-8 hours in his chemical bag total. I don’t know if the issue was his modge-podge sealer, or the multi-media coat, or what. 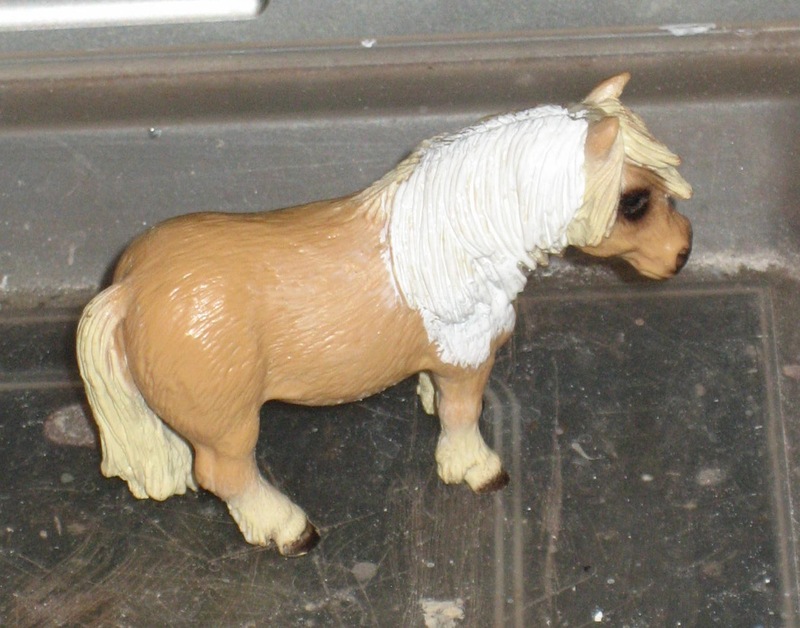 He didn’t clean up quite as well as the Stablemate, but certainly well enough to reprime and repaint. 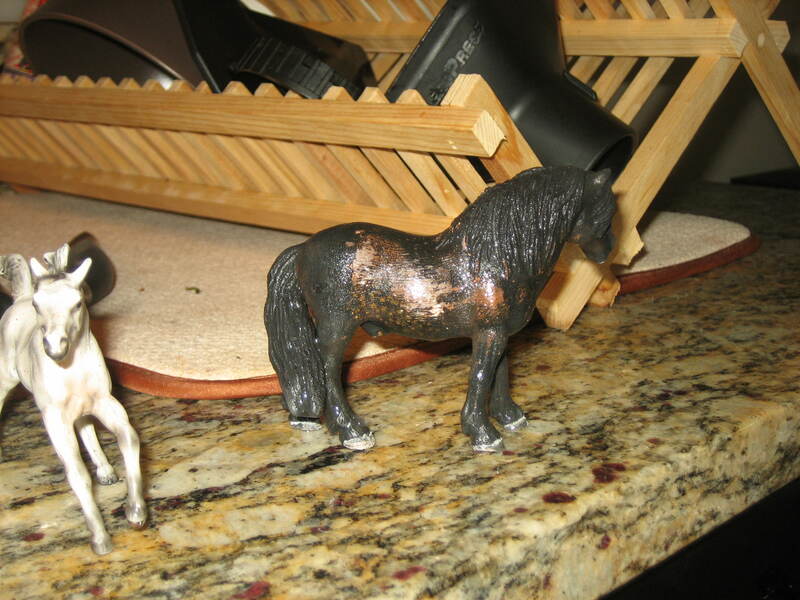 I stopped using the oven cleaner on him when I noticed that I was actually stripping of his original finish paint. 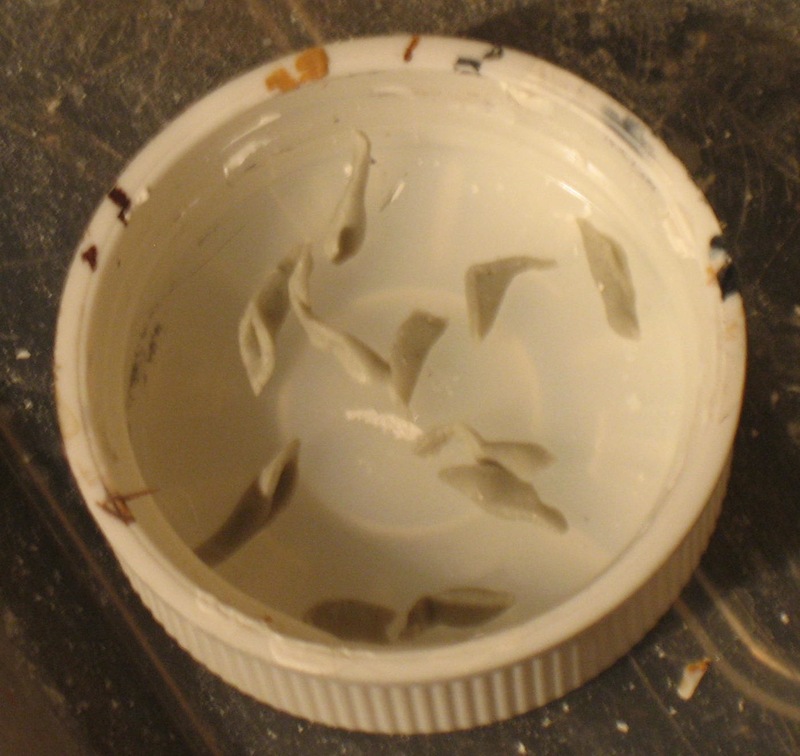 But the plastic itself seems fine, with no evidence of the melting or warping that acetone can cause. Ready for a new identity! At first the paint job on my newly acquired “Roll” resin seemed nice and smooth, and I considered sanding and painting him over without a full strip. But upon closer examination I saw that the thick acrylic on him was obscuring some of his detail, particularly in his feathering. So into the oven cleaner he went! Besides the toothbrush, I found my fingernails to be useful tools. 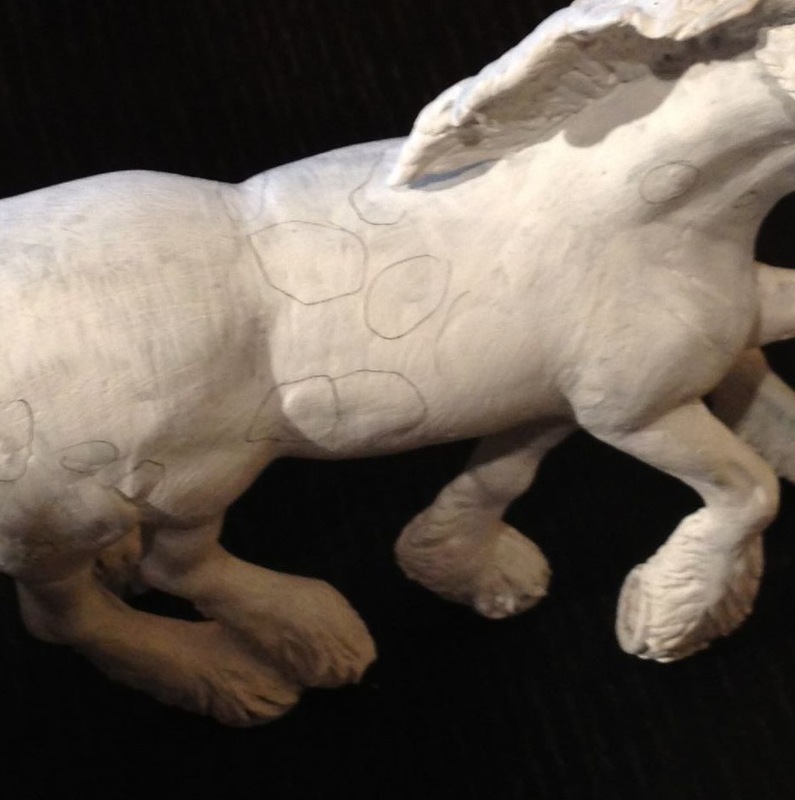 Although the main areas of paint came off easily in big pieces, he needed a lot more chemical therapy to get down to primer and into detail areas. Even when I declared him stripped (after maybe 8 hours total in chemicals, and multiple scrubbings) he still had some residual paint and primer in cracks and crevices, which I’ll just have to get in the prepping stage. But happily, he’s now much cleaner and ready to start his next adventure. And to my great relief, I don’t seem any damage at all to the resin from all the chemicals. Despite assurances from other hobbyists, I had worried. Overall, I’m pretty pleased with my new technique. It’s definitely nice to start afresh, and the oven cleaner makes it pretty painless, albeit somewhat time consuming. The price was right, too- Easy Off ran me about $6, and the can is still pretty full even after all the liberal spraying on these three horses. Next time I think I’ll be braver with the soaking times, and invest a few dollars in a hard-bristled toothbrush to use instead of the soft used ones I have.